As we are halfway through September, I decided to shop my stash for skincare products to include my next month's skincare routine. Skincare is something that I am generally slow to try, as effects of products do take some time. 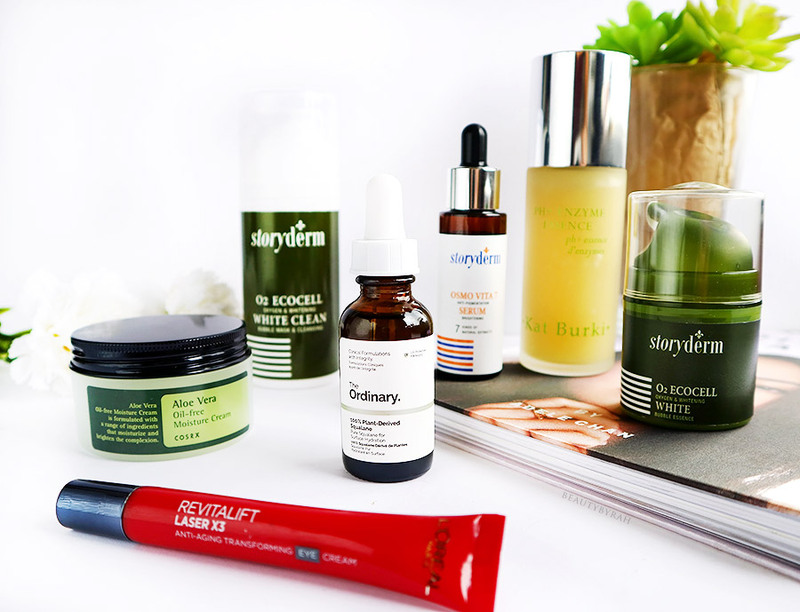 However, my current items in my skincare routine (featuring some items mentioned here) are almost finished so it is time to bust out some new items to treat my skin! The Ordinary has been treating me well lately so I thought I would go ahead and open another product of theirs to try. I have been loving their Caffeine Solution 5% + ECGC (review here) and their Lactic Acid 10% + HA 2% (peek here!). Squalane is a lightweight, non-comedogenic oil that is found naturally in the skin and it is moisturizing ingredient as well as being a source of replenishing fatty acids and antioxidants. I found a really useful and information article about squalane here, for your reading pleasure. This treatment is said to help hydrate and restore a soft, supple texture to all skin types (including acne-prone). It prevents moisture loss with regular use and can also be applied to hair to add shine and protect from damage. It sounds so promising and I can't wait to use it daily. I do have dehydrated and acne prone skin, so this does sound like a perfect fit. I tried it once so far and I have to say, a few drops is really all you need. I applied it after my serum and skipped the moisturiser, and my skin did not feel tight at all! So far so good. I got this for about SGD 10 (talk about affordable!) at BeautyBay, but Beautylish has it as well. I never really considered about pH levels of the skin but in reality, this plays a huge role in how our skincare products work on the skin. I did some research and this is what I understand so far. The skin's protective barrier (or scientifically known as the acid mantle) is a blend of oils and acids that aid in the protection from the harmful environmental pollutants and toxins while also preventing dehydration. For skincare products' formula to penetrate correctly and perform as promised without triggering dehydration nor irritation, the skin should be slightly acidic at around pH level of 5.5. Taken from their website, this product helps to optimise the skin's pH levels and it contains antioxidant turmeric (strengthens the barrier), vitamin C, pumpkin seed oil and papaya (support collagen to maintain skin structure and firmness), bioactive pumpkin and papaya enzymes (rich in iron, zinc, C and K to infuse the skin with phytochemicals and fortifying compounds which helps strengthen cellular responses and accelerate the exfoliation process). Based on this description, this sure packs a punch. 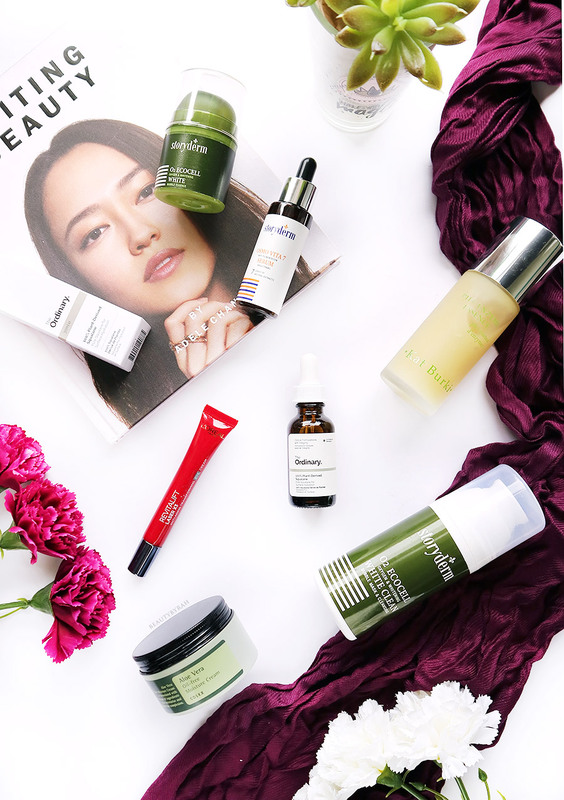 I do enjoy Kat Burki products, such as their Beauty Elixir in Cucumber (mentioned my love for it here) and their Illume Brightening Serum (here), so I really have high hopes for this! This is definitely a luxury skin care item though, retailing at USD 100 on Kat Burki's website. I received three items from Korean Beauty brand, Storyderm from Global Skin Pandora. They are the the Bubble Essence and Clean Bubble Mask and Cleanser from the O2 Ecocell White range and the Osmo Vita 7 Serum. 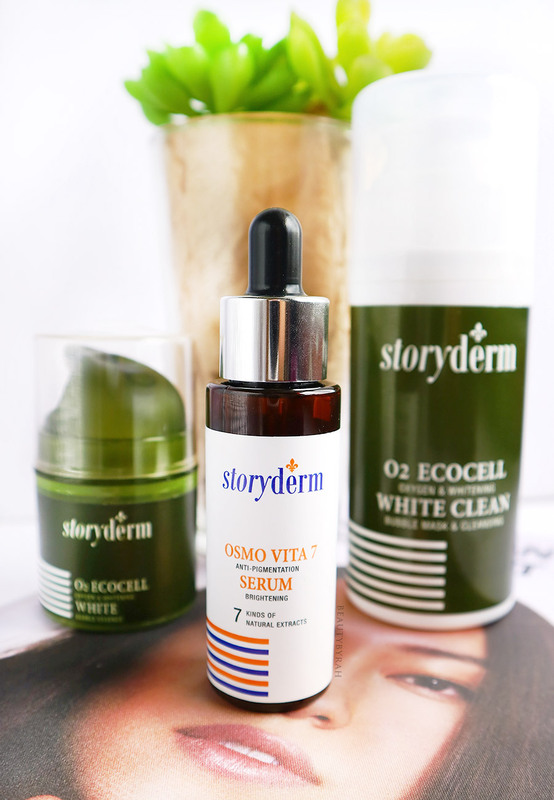 Storyderm is a Korean company that has its own laboratory to develop their skin care products for both home and professional use. After reading up on the brand and their products, I'm pleased that these items are affordable and accessible to many consumers. Out of these 3 items, the one that really intrigued me was the O2 Ecocell White Clean Bubble Mask and Cleanser. This is a gel cleanser that foams up almost immediately on the face when applied. An extremely similar concept to Clinique's Pep-Start Double Bubble Purifying Mask, if you are familiar with that. This cleanser is formulated with 12 kinds of plant extracts and is said to effectively purify the skin as the formula starts bubbling up on the skin surface. These small oxygen bubbles penetrate deep into the pores to thoroughly remove sebum, impurities and dirt. Sounds really good and I used it once so far, and my skin does feel really clean without being dry or stripped of its moisture. This retails for SGD 33. The O2 Ecocell White Bubble Essence is also pretty cool, and this is the first time I get to a product like this. This bubble essence is formulated with anti-oxidant ingredients of Green Caviar with oxygen bubbles and is meant to help hydrate the skin, improve the skin texture and brighten the skin. I have not tried this yet, but am excited to test it out! This is going for SGD 33. 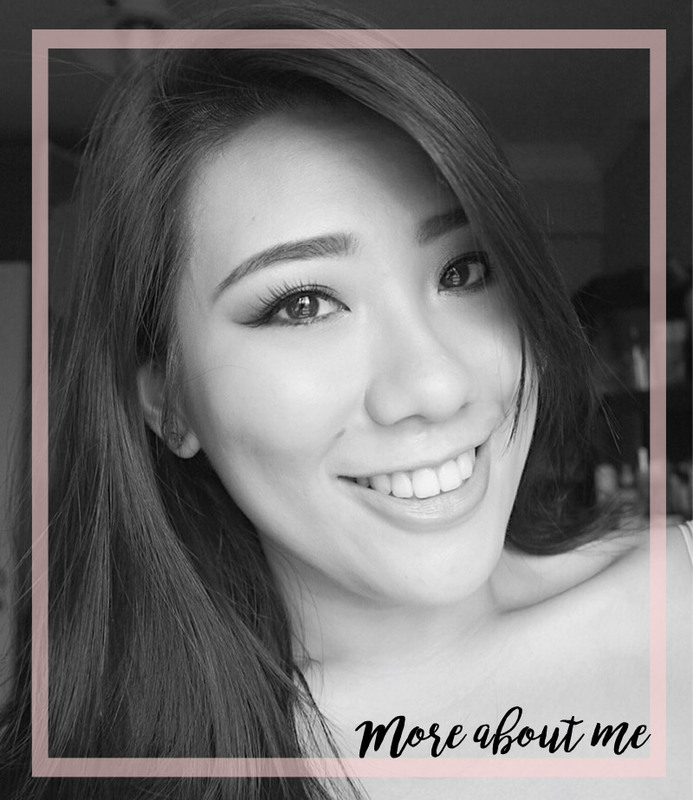 As I love whitening serums, as I have quite a bit of pigmentation that I would like to lighten or if possible, eliminate. In the Osmo Vita 7 Serum, there are 7 kinds of vitamin plant extract infused in this serum which helps to control the production of melanin, which in turn, reduces pigmentation and dark spots formation. This serum is infused utilises osmocell technology, which claims to be able to maximise the effect and function by delivering the various active ingredients to the dermis. This is said to help prevent the formation of future dark spots and other skin pigmentation while brightening the uneven skin tone with increased skin clarity. I have used this a few times so far and am liking how lightweight this serum is. It gets absorbed into the skin really readily and my skin does not feel heavy nor tacky after. I will add this into my skincare routine in hopes of achieving a more even and brighter complexion! This retails for SGD 28. If you would like to try these out yourself, you can use the code SARAH10%OFF on Global Skin Pandora's website if you would like. Riding on the Kbeauty train, I got this moisturising cream (even though it sound be named gel in my opinion) when I was in Seoul. I was searching for something lightweight to use in the day and save the thicker formulations for the night when I am all snuggled in bed with the air conditioning. I have been exploring CosRX as a brand, and I have been loving their Snail Emulsion Essence so I thought this would be a great add on in my routine for the upcoming month! This moisturising gel is said to provide intense and long lasting hydration while calming skin redness and irritation from sun exposure. I can't remember exactly how much I paid for it, but I am sure it was below SGD 30. However, you don't have to fly all the way there to land your hands on CosRX, Althea Korea (SGD 19) and Hermo (SGD 16.10!!) do have their items too! I do have pretty dehydrated undereyes and it's truly a bane of my makeup application life. Many concealers cling to my fine lines and creases are truly inevitable. This Loreal RevitaLift Laser X3 Eye Cream is said to be a triple action eye cream formulated with Adenosine that helps to smoothen fine lines, Pro-Xylane that helps to improve skin density and Caffeine to reduce the appearance of puffiness. This comes with a cooling metal tip which can be used to massage the eyecream under the eyes as well. Hopefully, this eye cream can help plump up and hydrate my undereyes and so that my concealer is less likely to be flaky or to settle into my fine lines. This retails for SGD 39.90 at all L'Oreal counters. Fingers crossed for these items and I will feature my favourites in my monthly favourites if I do enjoy them! Hope the rest of your September goes smoothly and well! 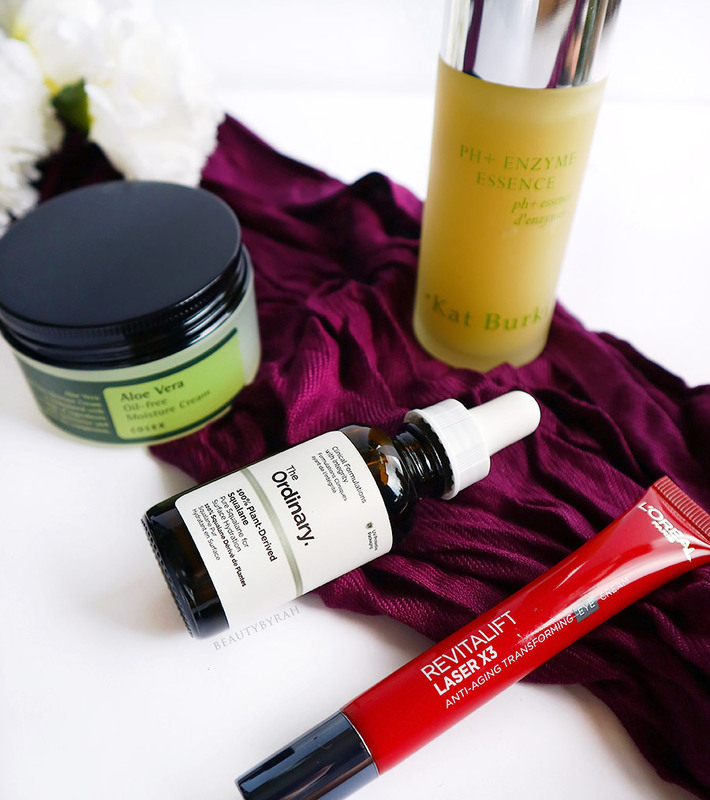 Are any of these products in your skincare routine already?